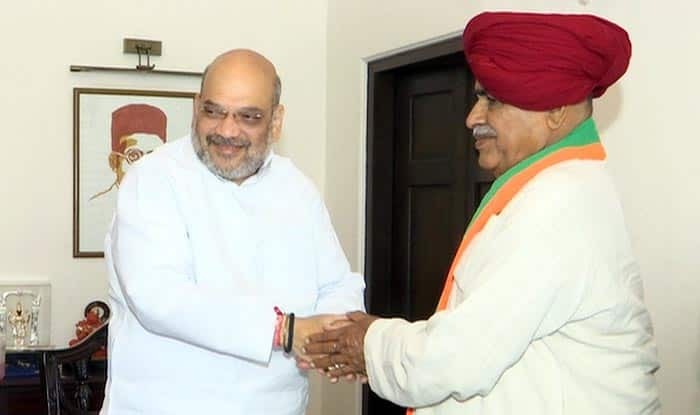 Gurjar quota agitation leader Kirori Singh Bainsla on Wednesday joined the BJP at the party's headquarters in Delhi. New Delhi: Gujjar leader Kirori Singh Bainsla and his son Vijay on Wednesday joined the Bharatiya Janata Party (BJP) in the presence of Union Minister Prakash Javadekar. “I have seen rarest of rare qualities in Prime Minister Narendra Modi and that’s why I am joining the BJP,” Kirori Singh Bainsla said, adding the PM interacts with common people and he is inspired by PM Modi’s working style. Bainsla said that he has been close to chief ministers of both parties — the BJP and the Congress — and had seen their ideologies. “After seeing two parties closely, I am joining the BJP,” he said. Javadekar said Bainsla had also met party president Amit Shah in the morning. He said that with each passing day, the BJP is emerging stronger in Rajasthan and win all 25 Lok Sabha seats.